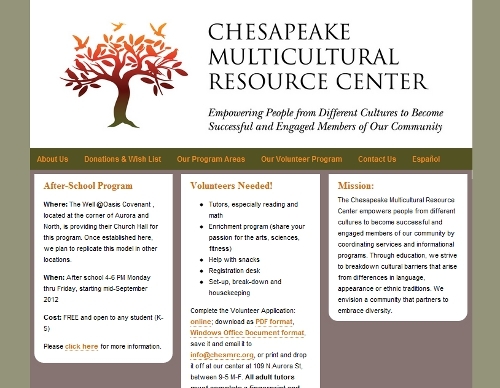 "As a startup, not-for-profit organization, The Chesapeake Multicultural Resource Center couldn't be happier with the result of our webpage designed by Tatiana and Line by Line Design. Tatiana worked with all the ideas presented from those involved in our organization and created a unique and extremely functional website that ended up meeting all of our needs. The added tutorials and trainings that Tatiana provided also helped us to understand more about website management so that we now have the confidence to make updates and changes as our organization continues to grow and expand. Line by Line designs by far beat out all the other proposals we received for our webpage design by price, but absolutely nothing was compromised in terms of quality and professionalism. It was a joy to work with Tatiana, and we will continue to recommend her work to those looking for creative and original webpage design."